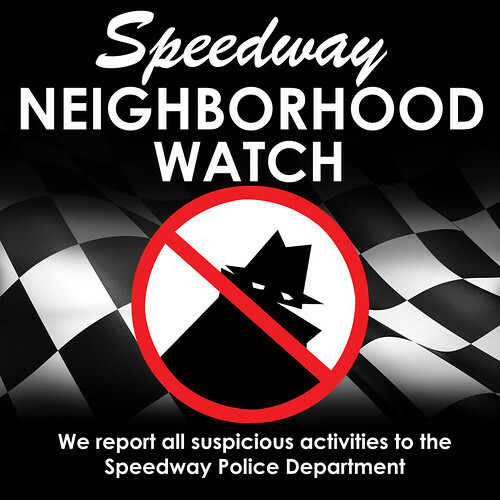 A Speedway Neighborhood Watch meeting has been scheduled for Thursday, November 30th at 7PM at Flanner & Buchanan’s Community Center. Click flyer below for more details. Please join the Speedway Police Department, Speedway Neighborhood Watch, and Citizens Academy Alumni for an evening of food, information, fun, and community spirit! Help strengthen police-community relationships by meeting with SPD officers, watching police demos, and learning about various anticrime initiatives. We’ll also have music, kids’ activities, information booths from public safety-related organizations, civic groups, town departments, and much more! See attached flyer for more information (click to enlarge). 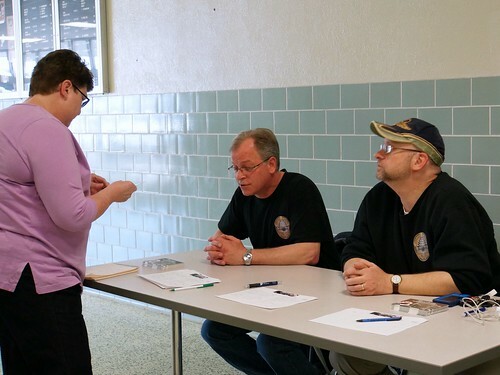 We had another excellent turnout for our April neighborhood Watch meeting! We want to thank all of you for attending, and want to apologize for the acoustics in the room and the difficulty people had hearing each other when we broke into discussion groups by District. We want our meetings to be a helpful and productive discussion for community concerns, and certainly we understand the frustration of not being able to hear well. We were pleasantly surprised by the excellent turnout, and we were standing room only! But we will work on finding a venue for future meetings that will work better for the breakout sessions. Sgt. 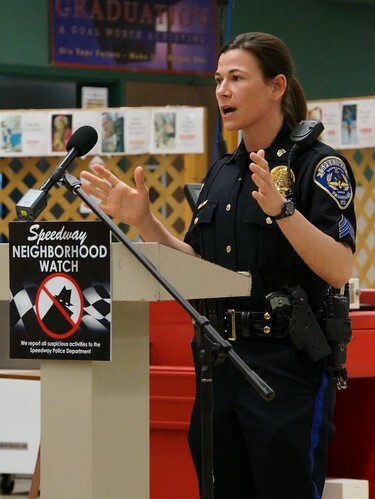 Mirantha Wilson of the Speedway Police Department welcomed everyone to the meeting and gave a presentation on personal and home safety. She discussed various ways people can improve their safety, from maintaining a state of heightened awareness of your surroundings to getting to know your neighbors and what is “usual” in your neighborhood. Sgt. Wilson also indicated that everyone should decide for themselves what levels of personal protection they wish to take and would work best for themselves and their families. Certainly, anyone who feels that purchasing a firearm is a good choice for them, should obtain all appropriate training and permits. There is also a personal safety class available through the Speedway Parks & Recreation called “Refuse to be a Victim.” The class is coming up this month. Click the link for more information and to register by May 11th! Sgt. Wilson also had Neighborhood Watch yard signs available for a small donation to the SPD Extracurricular Fund. Neighborhood Watch signs are certainly not a 100% sure means of crime prevention, but combined with our other efforts, do assist as a deterrent. The signs give more visibility to our Neighborhood Watch program, sending a message that our community cares and looks out for one another, and of course, partners with SPD and will call in any suspicious activities or other situations we feel SPD can assist on. 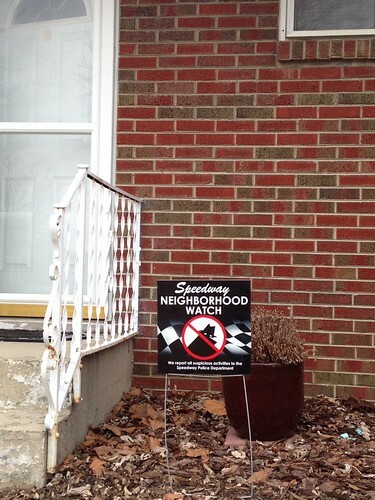 For more information on how you can obtain a Neighborhood Watch sign, click this link. Sgt. Wilson also discussed the need for Speedway residents to not be afraid to call in anything that they feel is a problem that requires SPD. She stressed that it is not a bother, and it is always better to get things checked out – even small things that don’t seem important. It is far better to call and have it turn out to not be a problem, than to not call something in that might have been prevented. Most often, people start out with small crimes, vandalism, petty theft, etc. Sometimes that seems unimportant, but by not calling in, sends a message to the bad guys that they can get away with it – and usually keep moving up to more serious crimes. Calling in something – however insignificant – could potentially prevent a crime and send a message to would-be criminals that we care and every time they try something, SPD shows up! We thank you all for your attendance, and again – we apologize for the sound problems! We hope to find a venue for our next meeting in June (date TBD) that will better accommodate the individual discussions. Neighborhood Watch Yard Signs are Available! 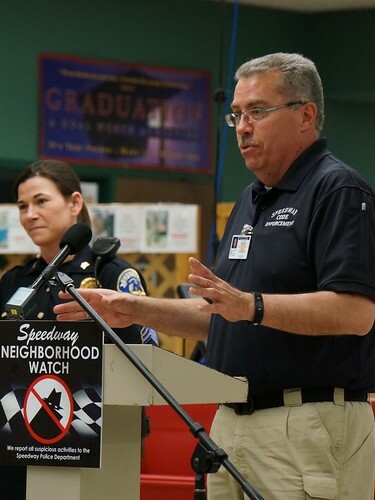 For a small donation of $6, Speedway Neighborhood Watch is now offering residents the opportunity to obtain Neighborhood Watch yard signs to post by your home, similar to a security system sign.You can obtain the signs by calling Sgt. Mirantha Wilson of SPD at the number listed below; email us admin at speedwayneighborhoodwatch.com (replace at with @) or message us through Facebook or Twitter, if you prefer. Partner with Speedway Police Department to keep our town safe! Each sign is 12” x 12” Coroplast w/ wire stake included. Signs are $6 each, and offered as a donation to the Speedway Police Department Extracurricular Fund. UPDATE 5/6/2014: We have more signs available for delivery! Please contact us to place your order! Great turnout for the Speedway Neighborhood Watch Symposium! We’d like to thank all of the Speedway residents who came out tonight to the All District Symposium. If you weren’t able to join us, we’d like to present a quick recap and invite you to attend future events and get involved in your District’s Neighborhood Watch. 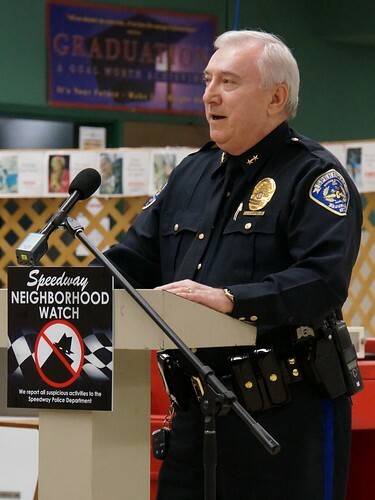 Lt. Trent Theobald opened the meeting by welcoming everyone, and talking a bit about his involvement with the Neighborhood Watch program, and thanked everyone at the Speedway Police Department who helped organize the event, as well as the District Coordinators. Lt. Theobald introduced Speedway Police Chief Jim Campbell and Asst. Chief Chuck Upchurch. Chief Campbell spoke about community policing and how police departments were not intended to be the only means of public safety. Residents and the police department need to partner together in an effort to solve community concerns, and help prevent crime. Residents serve as the extra eyes and ears of the police department and everyone is encouraged to call in anything suspicious. 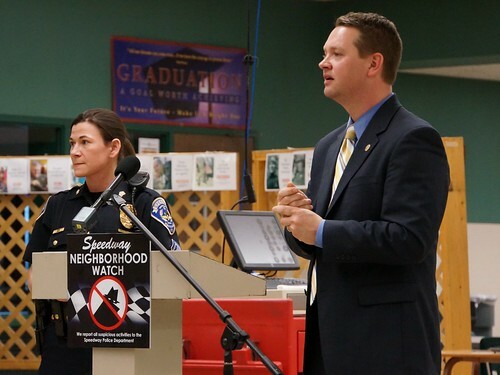 Next, Lt. Theobald introduced the new Neighborhood Watch contact from SPD, Sgt. Mirantha Wilson. Sgt. Wilson also talked about the importance of strong neighborhoods and for residents to watch out for each other. She mentioned the crimes surrounding Speedway, but stressed that while we have less crime, we are NOT immune from it happening here. It takes a commitment for all of us to care for our neighbors and neighborhoods, and to learn about the various ways we can protect ourselves and each other to form a strong Neighborhood Watch. She mentioned our site, as well as our various social media sites (see links at right). Sgt. Wilson also presented the group with prototypes of a Neighborhood Watch sign that residents display in their yards by their homes, to serve as a crime deterrent. When a presence is known that neighbors are watching out and will call the police to report all suspicious activities, it can deter criminals who might be casing neighborhoods to break into homes. Possibilities for the signs could be 12″ X 12″ or a slightly smaller, 10″ X 10″ sign. Also displayed were window clings which can be displayed in house windows. At this time, the yard signs and window clings are not yet available, but if we receive enough positive response, could be made available for purchase at a small cost. Feel free to comment with your feedback to let us know your interest! Joe Kramer and John Merritt from the Code Enforcement Division were also present. 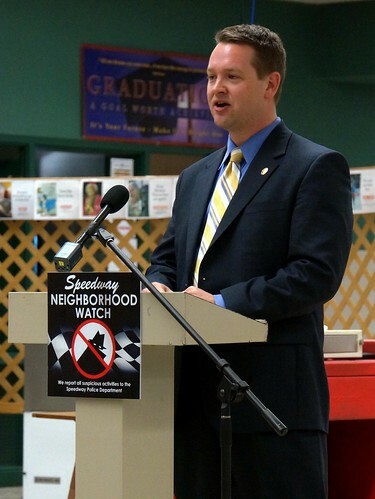 Joe Kramer spoke about what their division is up to, trying to work with homeowners to help keep neighborhoods clean and kept up, which helps property values – it also helps deter crime when residents care about their neighborhoods. Next, Sgt. Wilson directed the group to break into smaller groups by District. Each group met with a representative regarding their District to discuss specific concerns, and also had a chance to look at the yard signs and window clings – response was positive! We again thank everyone for joining us, and we look forward to seeing you at your District’s upcoming meetings. We will post information here and on our social media sites, as each District’s meetings are scheduled!